Audiences come from diverse backgrounds but they are one in excitement, appreciation, and anticipation for Disney On Ice: 100 Years of Magic . On Sunday 7th April 2019, Sunday, fans will come together from all sides of Hershey and converge at the Giant Center to be part of this amazing event. Tickets are on sale now. Don't be left behind. Heed the call to action — get your tickets now. Nothing beats the thrill of singing at the top of your lungs, along with your favorite concert artist right in front of you. 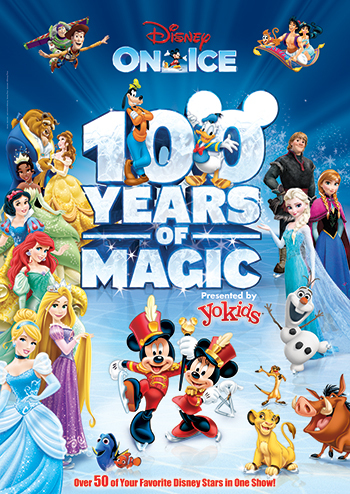 Now you'll get the chance to shout and let it all out as Disney On Ice: 100 Years of Magic hits the stage of the Giant Center on Sunday 7th April 2019. Hershey put your hands together as Disney On Ice: 100 Years of Magic will definitely bring the house down with countless smash hits. Fans from all over Hershey may have heard the shout out that tickets are now available. Now that's your cue. Get those fingers movin' and clickin' the 'get tickets' button right here, right now!